The vacations, blue skies, and warmer temperatures of summer mean … more time on the range, shooting! And there are many, many opportunities during the summer months to hone your shooting skills and test those skills against your fellow shooters. All the while using state-of-the-art Ballistic, of course, to make every shot count! The Big Daddy of long-range shooting competition is the Precision Rifle Series or PRS (www.precisionrifleseries.com). Now in its 7 th year, PRS features Open, Product, and Tactical Divisions. The 2018 PRS matches began in February, but they really gain steam in April and beyond, with numerous matches held during the warmer months at venues across the country. PRS also launched the new Gas Gun Series last year, with competitors using AR-style rifles. These matches offer many of the same long-range challenges of the more traditional PRS competitions, but with a faster time clock. Many PRS-related events are popping up around the nation, too, like the 2018 Absolute Zero Sniper Match Season ( ambushactionseries.com .) Hosted by Frontline Defense, a firearms training center in Warrenton, North Carolina, the Absolute Sniper Challenge consists of individual and team events held several times over the Summer of 2018. Shots are taken out to 1,000 yards, and most of the summer matches count towards the PRS Club Series Matches for the Southeast Region. Of course, the National Rifle Association (NRA) and the Civilian Marksmanship Program (CMP) host long-standing shooting competitions year ’round, but especially during the summer. The NRA’s High-Power Rifle Competitions (http://competitions.nra.org) are held at numerous shooting ranges across the country and attract some of the country’s top competitive shooters. The CMP’s Talladega Marksmanship Park (thecmp.org/competitions/matches/) is home to scores of different shooting competitions. Boasting the latest technological advances, this 500-acre facility is open all year, to the public, and attracts shooters of all ages and experience levels. 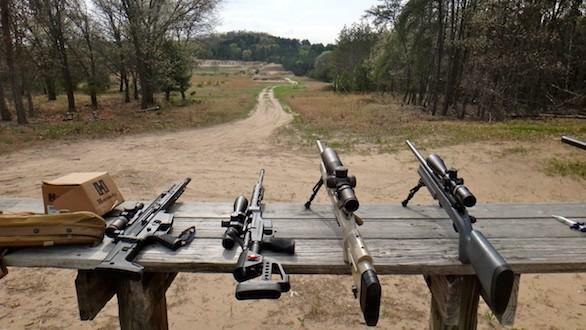 Located just two miles from Alabama’s renowned Talladega Superspeedway, the facility features a 600-yard rifle range with targets at 200-, 300- and 600-yards. When practicing for or competing in these events, remember: next to his or her rifle, a long-range shooter’s best friend is Ballistic, the top-selling ballistics calculator that goes everywhere a shooter goes. For more information, please visit ballisticapp.com. Just Drifting Along: Ballistic, Wind Drift, and First-Shot Hits! The Year That Was – And The Year That Will Be!